Pho­tog­ra­phy pod­cast #98 talks about why it’s OK to crop pho­tos. Many pho­tog­ra­phers on the Net and through­out Photography’s his­tory seem to be against crop­ping and in this pod­cast I explain why I am NOT one of them. Guer­rillero Hero­ico by Alberto Korda — The cropped pho­to­graph of Che Gue­vara is one of the most rec­og­niz­able pho­tos on planet earth. Although the orig­i­nal is still a strong pho­to­graph, unlikely it would have become the icon it is with­out the crop. 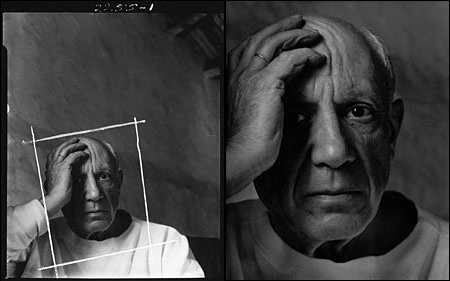 Pablo Picasso by Arnold New­man — Arnold New­man was a strong believer in doing what­ever worked to improve his pho­tographs. This obvi­ously included crop­ping out about 65% of this very famous portrait. 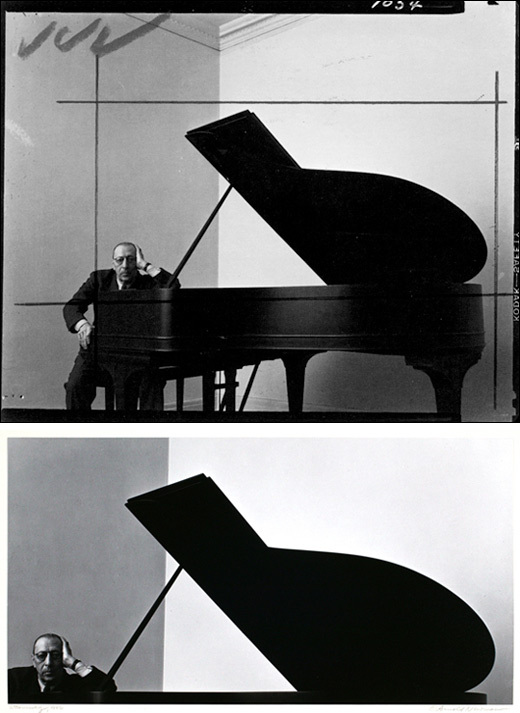 Igor Stravin­sky by Arnold New­man — Most peo­ple would agree that the cropped ver­sion of this pho­to­graph is much stronger. In this case, less is WAY more in this unusual but extremely effec­tive crop. 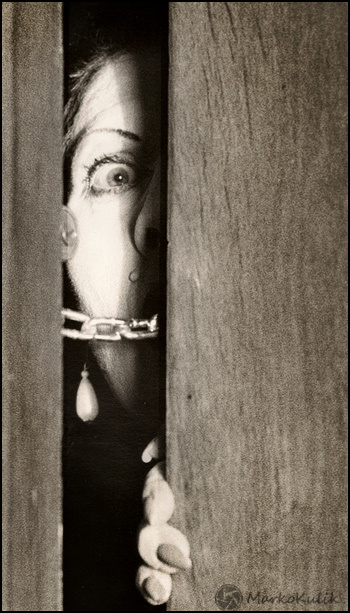 Woman at the Door by Marko Kulik — This crop is uncon­ven­tional and delib­er­ate but I feel it helps the image and that’s the only rea­son it’s there. Thanks to forum mem­bers Jimmy, Scorpio_e, and Bren­dan who posted blog com­ments about our last pod­cast. Thanks as always to every­one that sent com­ments by email about our last pod­cast. Although ALL com­ments are appre­ci­ated, com­ment­ing directly in this blog is pre­ferred. Thanks as well to all the new mem­bers of the bul­letin board. Most of the links to actual the prod­ucts are affil­i­ate links that help sup­port this site. Thanks in advance if you pur­chase through those links. 100% with you on this one Marko. I couldn’t agree more on crop­ping — and the Che pic­ture is a per­fect exam­ple. There’s no way the orig­i­nal would have been used in such a way as the cropped ver­sion did. Short, sweet, and to the point. Great episode! Hmmm — that’s very odd Yise­haq, there should nor­mally be no issue crop­ping to that size if the orig­i­nal was sharp and not taken at an ultra high ISO. Per­haps if you are crop­ping away 95% of the image and overen­larg­ing the remainder…but I highly doubt that. My first guess is that the set­tings in your graph­ics pro­gram are mak­ing things wonky when you resize. Maybe post an exam­ple on the forum for a bet­ter back and forth about this? Thx as always for the com­ments everyone! Thanks for the usual great pod­cast. I can under­stand that crop­ping improves/saves images com­po­si­tion­ally speak­ing. What about qual­ity wise? I usu­ally try to crop to improve my images but when I try to resize them to my pref­er­ence 800X600 px or around there, it loose the qual­ity, spe­cially on those images which are cropped tightly like the che photo shown in your blog. Any advice on that? Wow another great pod­cast! I really appre­ci­ate your inclu­sion of those iconic images to demon­strate so well the power of crop­ping. I’m sure that the pho­tog­ra­phers would have sframed up in cam­era the end result if they had 1-been able (per­haps dis­tance to sub­ject was dif­fi­cult to achieve ie:Che Guevara’s shot) or 2 — they didn’t “see” the end image at the time ie:Stravinski and Picasso, both of those images were good to begin with, but a cre­ative crop made them great. That goes to show that even when you think you’ve got “the shot” go ahead and play with the crop a lit­tle it costs you noth­ing but a few sec­onds and might just turn that shot into an icon. a great topic. As you said crop­ping has been going on for a long time. I ALWAYS cropped when print­ing my 35 mm in the dark­room. It was just part of the process. Although pix­elpeep­ers will dis­agree, there is noth­ing wrong with a crop­ping an image. In many cases when you make a print from a dig­i­tal file, some­thing has to be cropped. I believe the prob­lem is not enough peo­ple are mak­ing prints. Thanks for tak­ing time to cre­ate and dis­cuss crop­ping on the podcast. Great pod­cast. I agree with you regard­ing the crop­ping as more often than not it can be dif­fi­cult to iso­late the crap in the viewfinder. The only thing I would add is that if a pho­tog­ra­pher has in mind to print out an image large size in say A1+ size with the inten­tion to pre­serve detail surely there would be some image degra­da­tion if too much is sliced out of the orig­i­nal image. That is unless some­one has a high megapixel camera.